First things first: My blog went down, it’s now on a new server, but the database is not 100% restored, you may find incomplete posts – hope I can fix it. 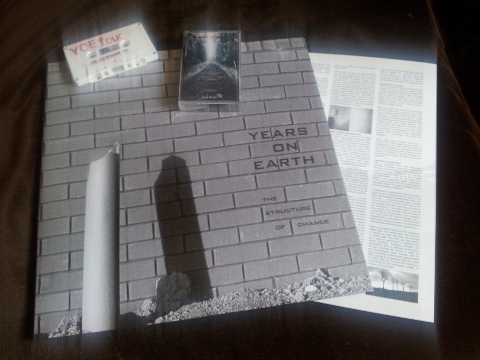 In my mail today: Years On Earth’s vinyl debut, 30 years after their highly collectible cassettes came out. A wonderful item, this double LP with 7″ single. I’m no vinyl specialist, but to me it seems to be a work of extra quality. Heavy cardboard cover, heavy vinyl, plus an impressive band bio on an enclosed thick sheet – this has been made for eternity. And it’s limited to 500 numbered copies. Better be quick. You can get it for only 25 € directly from Vinyl On Demand. I did not compare yet to the cassette releases, which I featured on this blog here a while ago (and which have been rereleased through Calypso Now, where they are still available) – but the vinyl sounds great. Certainly the best masters have been used, plus the vinyl mastering has been done by an industrial music specialist, Andres Peterson at ghostsounds.net. The two LP use tracks from the three official releases of Years On Earth, plus almost an LP worth of bonus tracks (if you count in the 7″ EP), all recordings from the period. I’m very happy that the tapes of Years On Earth are still available through my label, plus a later solo recording by Bob Roke, one half of the duo. You should get them all, the vinyl, the cassettes, as long as it’s still possible. I’ve also posted my YOE-documentation earlier on this blog for you to read. As we always used to say, Be There Or Be Square.